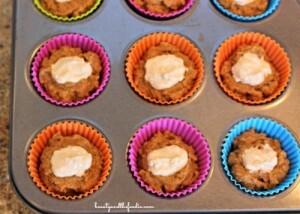 Sour Cream Pumpkin Butter Muffins- are grain free, low carb, pumpkin spice muffins with a sour cream pumpkin butter center. So very good, and has easy to follow photo instructions below. 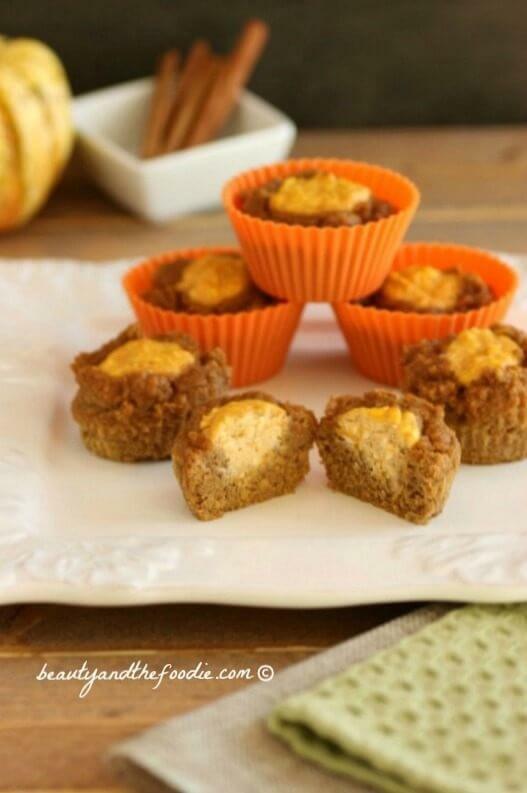 Fill the cups with pumpkin muffin batter. Made an indentation in each muffin center with a spoon. Filll each center indentation with sour cream pumpkin butter filling and bake. 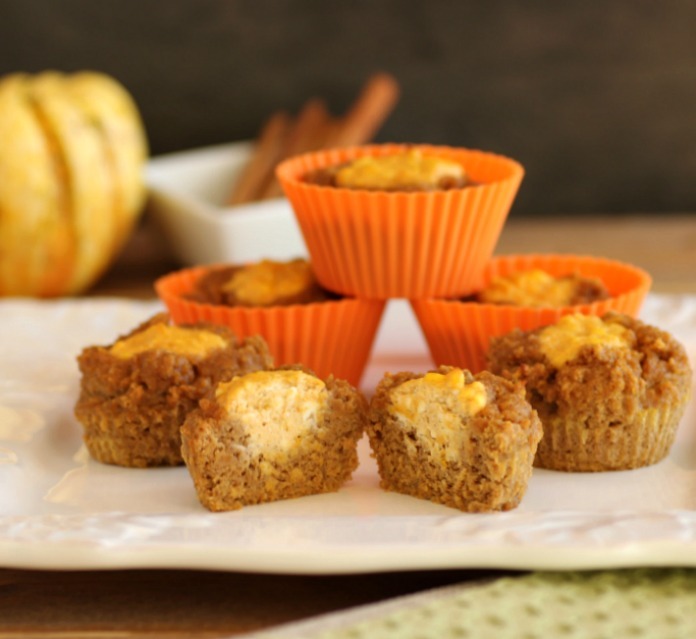 A delicious fall pumpkin muffin recipe. cup Sweetener of choice: 1/3 pure maple syrup for primal or for low carb use 1/3 cup low carb (sugar free) maple syrup + 1/3 tsp liquid stevia. 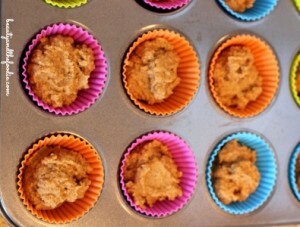 Preheat oven to 350 F, and line with baking cups, or grease a medium size muffin pan. In a large mixing bowl combine: ½ cup sifted coconut flour, 1 tbsp pumpkin pie spice, and ½ tbsp ground cinnamon. Mix until thoroughly combined. Set aside. In second large mixing bowl combine: 3 eggs, ½ cup pumpkin puree, 1/2 cup milk of choice, 1/3 cup sweetener of choice, 1/3 tsp stevia if making low carb version (omit for primal), 2 tbsp melted butter or coconut oil, 1 tsp vanilla extract and1 ½ tsp baking powder. Mix until thoroughly combined. Pour wet mixture into dry mixture and combine thoroughly, scraping the sides and breaking up any clumps. 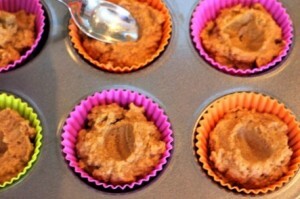 Spoon batter into prepared or lined muffin pan. Press a depression in the center of each muffin with a spoon* see photo above. In a medium mixing bowl combine: 1 1/2 tbsp sour cream, 1 tbsp pumpkin puree, 2 1/2 ounces cream cheese softened, 1 1/2 tbsp sweetener of choice, 1/8 tsp cinnamon. Mix thoroughly until smooth. Spoon a small amount (1 ½ tsp) of sour cream pumpkin mixture into each depression of the muffin center *as seen in photo above. Bake at 350 F for 25 to 30 minutes or until top is firm and browned. Remove and cool. Can be served, but are best when refrigerated awhile before serving. Store unused portions in the fridge. Thanks so much for all the hard work you have done on these recipes. Compiling all the nutritional info for 3 to 4 different ways of eating is not easy. Very meticulous job! I subscribed and am looking forward to receiving the breads ebook. Also I am sharing your page’s link to group members of a keto group I follow. I’m sure they will be as excited as I was to cind your site. Awe, thank you so much, Barabara. You’re so very very kind! I appreciate you taking the time to share. love pumpkin! and your recipes! I live in Budapest and cannot get real pumpkin or the puree you show. I do have several cans of pumpkin that US guests have brought over. Can this be substituted? I’m quite sure if it some kind of canned, unsweetened pumpkin, then you could use it. If it is pre-sweetened then, you may want to leave out the other sweetener. I cannot seem to print your recipes, tried several ways, several times; any inside info I need to know? Joan, I checked in a couple different browsers and both print recipe cards were working. Perhaps it was a glitch. If it is still not printing, let me know what browser you use so I can trouble shoot.